I’ve long supported the theory that in the realm of computer animated features, underwater reigns supreme! 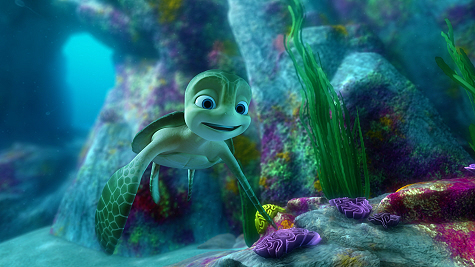 Beginning with Pixar’s Finding Nemo and then taking into consideration DreamWorks’ Shark Tale, the list goes on to include The Reef 1 & 2, Dolphin: The Story of a Dreamer, Legend of the Sea, Sea Level, Back to the Sea and a pair of Turtle Tales (the sequel to this one was released in July, 2013). While I can only suppose the reason this genre is so popular stems from the fact that we live in a world that’s 75% water and, well, there’s plenty of fish in the sea. 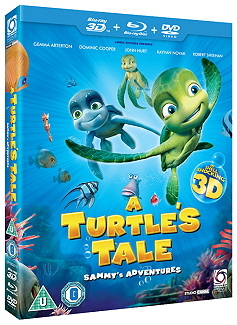 Bad puns aside, A Turtle’s Tale: Sammy’s Adventures (also known as Sammy’s Adventures: The Secret Passage) is a 2010 Belgian animated film produced in English. It comes in at a runtime of 88-minutes and is unrated though really there’s nothing here that would prevent it from getting the G-rating that Finding Nemo enjoys. You’ll note I mentioned that it was produced in English- this is important because films originally recorded in a foreign language that come across the pond only to get slapped with an English dub track are more often than not exercises in disaster with mismatched mouth flaps, painfully stiff conversation flow and absolutely no comedic timing. Take comfort in knowing Studio Canal avoids any such snafus here. The story here centers on the exploits of a sea turtle (Sammy) who embarks upon a journey that will take him around the world and back to the beach where he was born. The film opens with narration by William Hurt as old turtle-Sammy on the very beach he was hatched several decades earlier. While crowded and populated now, his flashback to his own hatching reveals a much more clean and serene beach and thus sets off both a theme of things to come and a journey which could well have been called “A Series of Unfortunate Events” had Lemony Snickett not beaten these guys to the punch. Make no mistake, the backstory of a single turtle’s journey from hatching to finding a mate to returning to the beach of hatching to see his grandkids off to a life at sea is certainly decent but prepare for a near constant succession of setbacks and crises, most of which are a direct result of humanity’s influence over nature. Before sliding below the waves, Sammy makes a lifetime friendship with Leatherback Ray (Anthony Anderson). From there it’s our first taste of humanity’s negative touch in the form of an oil spill. Netting, illegal whaling, pollution, the film quickly runs the gamut of negativity but all hope isn’t lost once Sammy encounters the hippie Snow (Melanie Griffith), her cat, Fluffy (Tim Curry), and slightly older female green turtle Vera (Kathy Griffin). While the script is never razor-sharp or overly clever, it’s passable enough for adults, who will likely find enjoyment in watching the slow changes of society throughout the span of the film (Sammy is supposed to have been born in 1959). Kids however will likely delight in the clean, colorful visuals and fleshed out characters to be offended by the oft heavy handed themes of environmentalism present here. In all, A Turtle’s Tale certainly succeeds in providing an hour & a half of family-friendly entertainment (be forewarned the domestic release contains nothing in the way of special features- not even a commercial in the beginning). The lack of cleverness will certainly keep it from infringing upon Pixar’s territory but solid visuals and a bit educational value should hold the interest of the younger ones. The soundtrack is also noteworthy for its attempt to chronicle the given eras of the film with contemporary musical entries. 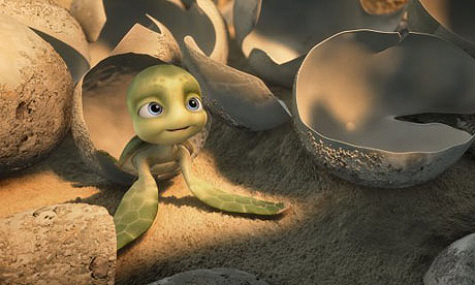 It may be true that A Turtle’s Tale fails to tread on Pixar or DreamWorks’ supremacy of the medium, it should also be noted that it was considered successful enough to warrant a sequel.